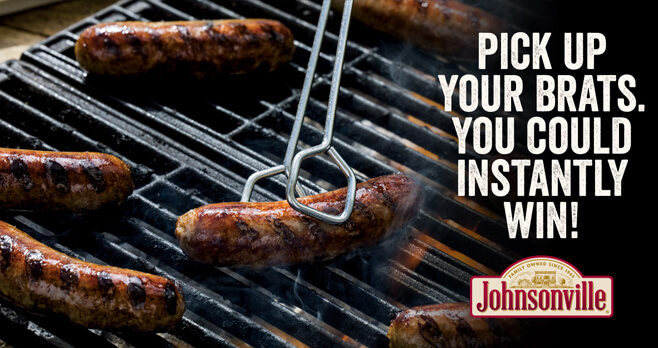 It’s time to play the Johnsonville First Brats Instant Win Game! Buy Johnsonville sausages at select retailers to get a game code and visit johnsonvillefirstbrats.com to enter it. You could instantly win fun Johnsonville swag. Play daily through May 15, 2018.
Who Can Enter? The Johnsonville First Brats Instant Win Game is offered only to legal residents of Colorado, Idaho, Illinois, Indiana, Iowa, Michigan, Minnesota, Missouri, Nebraska, North Dakota, Ohio, Pennsylvania, South Dakota, and Wisconsin who are at least 18 years old at the time of entry. When To Enter? Sweepstakes begins on March 15, 2018 at 12:00 PM (noon) ET and ends on May 15, 2018 at 11:59:59 PM ET. What Is The Sweepstakes Prize? The Prizes consists of either a Knit Cap with Cuff & Pom, Hooded Sweatshirt with Beverage Holder & Bottle Opener, Beverage Glove, or Fur Flyer’s Hat. Who Are The Sweepstakes Winners? To obtain any legally required list of winners, mail a self-addressed, stamped business-sized envelope to: Johnsonville First Brats Instant Win Game – Winners List Request, P.O. Box 251328, West Bloomfield, MI 48325. Winners List requests must be received by July 30, 2018.